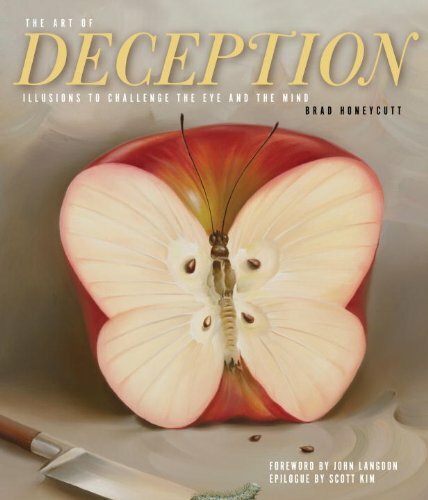 The Art of Deception is wonderful book of optical illusions and artworks curated by optical illusion enthusiast Brad Honeycutt. I've also reviewed the author's previous book The Art of the Illusion which I enjoyed as well. The book's 224 pages, hardcover, and uses nice thick paper. 200 images are included. The artworks featured are a mixture of paintings, photographs, occasional sculptures, 3D chalk painting and other creations. Some of the more prominent artists included are Erik Johansson, Ben Heine, Oscar Reutersvard, Tracy Lee Stum, Vladimir Kush, Rob Gonsalves and Bev Doolittle, to Istvan Orosz, John Langdon, Scott Kim and more. I had fun going through the work, marvelling at the creativity involved in the conception and creation. There are simple optical illusions made of just line drawings to complicated staged photographs. Some pages have me staring at them for minutes trying to figure out the illusions involved or trying to see the images in a way to reveal other hidden images, e.g. finding an image in a painting of repeated patterns. There is a lot of creativity involved and this is one book that will delight those who like images that play tricks on your eyes. The author has a blog called An Optical Illusion where you can even check out more illusions.